The Palazzo is the tallest completed building in Nevada, although the Fontainebleau Resort Las Vegas, currently under construction, is already taller. The Palazzo is owned and operated by the Las Vegas Sands Corporation. Designed by the Dallas based HKS, Inc., the property’s design is marketed as being reflective of a modern European ambiance and luxury living. This all-suite hotel offers the largest standard accommodations on the Las Vegas Strip at 720 square feet (67 m2) per guest room. 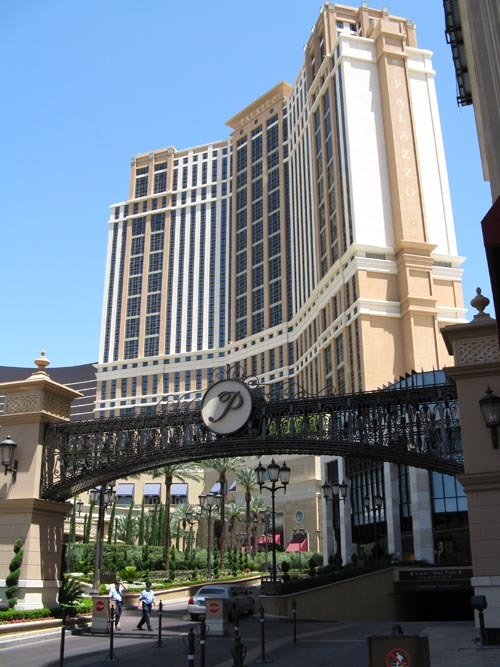 In its first year of eligibility, The Palazzo was awarded the AAA Five Diamond Award for 2009. Casino: Yes, 105,000 square feet. Casino games include 1,900 slot machines and 80 table games. Race & Sports Book: Yes, Lagasse’s Stadium at the Palazzo is a large race and sports book featuring a 10′ x 20′ projection screen and over 80 flat panel televisions along with a menu by Emeril Lagasse. Restaurants: The Palazzo has the following dining options: Canyon Ranch Grill, Carnevino by Mario Batali, CUT, Dal Toro, Dos Caminos, Espressamente Illy, First, I Love Burgers, Lagasse’s Stadium, LAVO, Morels, Sushi Samba, Sweet Surrender, Table 10 by Emeril Lagasse, Grand Lux Palazzo, Zine and a seasonal restaurant, Wolfgang Puck’s Solaro. Entertainment: Palazzo is home to Jersey Boys in the 1,650-seat Palazzo Theater. There is also a 400-seat Palazzo Showroom. The neighboring Venetian is home to Blue Man Group and Phantom – The Las Vegas Spectacular. Nightlife: Yes, Lounge at Sushisamba, Laguna Champagne Bar and the nightclub, Lavo.The neighboring Venetian is home to Tao nightclub. Attractions: Yes, a Lamborghini dealership and showroom. Pool: Yes, a 4-acre pool deck with six pools, four Jacuzzis, cabanas and a seasonal restaurant, Wolfgang Puck’s Solaro. Health Club or Fitness Equipment: Yes, the Palazzo and the Venetian will share a 21,000-square-foot fitness center that covers the bottom floor of the Canyon Ranch SpaClub. Spa: Yes, the Palazzo and the Venetian share the 69,000-square-foot Canyon Ranch SpaClub, which has 62 treatment rooms and offers multiple types of massages and services. The spa also has a 21,000-square-foot fitness center, 40-foot rock climbing wall and a full-service salon. Shops: Yes, a 450,000-square-foot retail complex, The Shoppes at the Palazzo, with more than 50 upscale stores, including Barneys New York, Coach, Ralph Lauren, Jimmy Choo, Michael Kors, Ethel M and a rare book shop. Wedding Services: No, but the Wedding Chapel at the Venetian offers a number of wedding ceremony packages. Convention Rooms: Yes, there is 1.9 million square feet total, including the 85,000-square-foot Venetian Ballroom, the 650,000-square-foot Venetian Congress Center (which includes three ballrooms, 64 meeting rooms and three board rooms) and the 1.2- million-square-foot Sands Expo convention center. Hotel Amenities: Laundry, luggage and maid services, currency exchange, direct access to the Sands Expo Center, concierge, rental-car reservations, golf reservations, safety deposit boxes and wake-up call service. Standard Room Amenities: Air conditioning, remote-controlled cable TV, desk, electronic door locks, in-room safe, telephone, voice mail, hair dryer, iron and ironing board, fax machine, alarm clock and radio, minibar. Policies: Children 12 and under stay free with an adult. The maximum total number of guests (adults and children) in a room is four. Incidental Charges: The Palazzo has a mandatory $17 ($19.04 with tax) per room, per night resort fee. This fee is not included in your reservation and will be collected by the hotel at check-in. The resort fee includes: daily access to the Complete Fitness Center located inside the Canyon Ranch SpaClub for up to two guests, unlimited in-suite high-speed internet access, unlimited local and toll-free telephone calls and a daily newspaper. A credit card is required for incidental charges.